When it comes to price money of an auto, no one can doubt buying it for an affordable price unless someone dares to auction it for a premium value. The lifestyle of car fans nowadays is trekking to a wild adventure isolating awareness of price digits in a particular car product. Wait until they see these stunning vehicles that will blow their minds away. These cutting-edge exterior specs are something to die for. 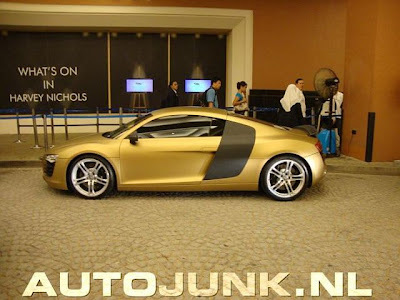 On Wheels Show, all eyes were drawn into the attention of shimmering gold exterior tuning. The C63AMG auto was drenched in gold-plated armor not to mention the weight of those price digits. As what critics mentioned, the price tag of the car jewelry costs nearly five million US dollars. The Cadillac CTS Coupe is popularized by its sporty get up. But, what if designers decided to blend style with a savor of richness? In fact, it so happen in China during the Qingdao International Auto Show. From diamonds to fancy pearls, the Cadillac was dressed in Swarovski crystal attire stretching from the back rears to the front hood. The grille was not covered; however, audiences could not believe the massive effort of attaching 350,000 crystals to the body. Another impressive auto exterior moding is the Hyundai Equus DUB edition auto that was displayed during the Specialty Equipment Market Association (SEMA) show. Thinking of black covered auto, this high-definition vehicle captivate car fans’ attention when it gave them concepts on how to modify such body style into a deluxe dynamic system. DUB is well-known for its exquisite smooth car designs where they highlight certain car makes, hybrid engines, cool exteriors and many others more to provide a new wave to the automotive industry. When they take Hyundai to a refined customization, the exterior specs were magnificent. Charcoal black was its luxurious theme giving tinted window with tail lights, glossy black paint, DUB trademark mesh grille and 24-inch of P-zero Nero Tires made from alloy wheels. Audi has also driven fans to a craze of excitement. Whatever that is contained in Audi’s front hood modifies to a speed chase aerodynamic strength pumping power and impressive performances. It was an upgraded edition of the R8 version when engines are designed to optimize powerful performance with more horsepower and torque force. At 335 km per hour of maximum speed, the vehicle also maximizes its price costing about US$500,000 in the market. When it comes to tuning techniques, Car Tuning Tips is considered as the breakthrough and cutting edge a car owner should look for. These tips cover the latest procedures and methods to make your car come up with the topmost performance. The truth is that there are so many things that can be done to enhance a car but you have to accept of the mantra for car tuning which is “there will always be a hidden cost.” So, you have to make it sure that you should work to come up with a powerful engine that you can afford so that you will have the best result for your car tuning investment. Generally, Car Tuning tips will push your car engine harder so that it will require you to come up with servicing intervals that are frequent. This will essentially maintain the reliability of your car in the long run. With an erring engine, you will surely come with a great deal of fuel or power loss in the process. This is especially true when your car comes with an engine that is inefficient. These weaker components should be up-rated so you can cope for extra power. All car enthusiasts want their vehicle to be at its best, which definitely involves much more than just an occasional oil change or car wash. When you want your car to look more attractive and stylish, it all boils down to car accessories. Finding the right auto accessories and parts can be a difficult task though, especially if you don’t know where to start from. Here at CARiD, we specialize in providing drivers with the top-tier aftermarket accessories and premium auto parts that can boost the power of any vehicle and add a distinctive touch to its appearance. Whether you want to level up the style of your car, need protection, or simply want to add some comfort, we store an extensive selection of auto accessories for you to choose from. Custom wheels, grilles, headlights, chrome accessories, air intakes, and exhaust systems; we’ve gathered all the things that unveil the beauty of your vehicle and wake up the beast inside its engine. Turin, Italy – basing from the characteristics and certain features of the 2013 Dodge Dart, the unveiling of the Dodge Dart Begets Fiat Viaggio will take place sometime in April 2012 and will be witnessed at the 2012 Auto Show in Beijing, China. “Viaggio” means journey in Italy is said to be assembled in China in the later parts of 2012. This is going to be marketed soon through Fiat’s connected venture with the Guangzhou Auto, which has been reported by the Automotive News. According to the news, there are a great number of media outlets in Italy, which have probed, even deeper in regards to the information and details of the Dodge Dart Begets Fiat Viaggio, particularly on the venture that will soon have to undertake. As a matter of fact, some of the details and information about the upcoming venture of Viaggio have been hinted by Fiat’s top executive Sergio Marchionne. The top executive said that they have no plans of developing this particular Doge model for global purposes. However, the boss added that the Dodge is going to serve as a top donor for all other cars, which will be made any time in the future. In China, it is expected that a version of the Dodge Dart Begets Fiat Viaggio will be sold. This means that the person who can buy the version is going to be a one, lucky guy who will enjoy the freshness of the newly built and newly designed car from Dodge. The name “Viaggio” has been reported by a publication in Italy known as the Corriere della Sera. The report included additional details of the car and the rendition of the artist. This has been provided by the Italian Magazine known as Quattroroutte. Automotive News, the Viaggio will be using turbocharged and normally aspirated versions of the Fiat’s 1.4 L 4-cylinder fuel engine, which have also been made and developed by the joint venture partners of China. Lastly, a hatchback version of Viaggio is planned to be exported in Europe as reported by the publication. Car enthusiasts have grown in numbers tremendously in the last decade brought about by the massive reduction in cars and car parts prices. And aside from the traditional vehicle parts, exterior tuning and moding accessories have also become cheaper resulting in the increase of new design options in almost all type of cars. Car exterior tuning can be a do-it-yourself job or one can just safely ask the assistance of many tuning specialists. Exterior tuning and moding is not only done to simply beautify a vehicle but to enhance its performance as well. Most car tuning accessories are designed to provide drivers with better car handling options and at the same time give their vehicles that unique stylish look. Car moding and tuning is done to put that personal touch that car owners want in order to imprint their personal preferences in their cars. Special accessories are added to the car and body modifications are applied in order to meet the personal and driving expectations of the owner. Car tuning parts are added and the cars tuned so that they would get more economical. Others tune their cars to boost their built-in power to give the driver additional speed, driving comfort, and a better handling experience. Exterior tuning and moding definitely enhances the performance of a car, not only its looks. How does exterior tuning and moding do that? Aftermarket parts installed on an average car provides additional aerodynamic features not present in its original unaltered state. Side skirts, spoilers, splitters, bumpers for both the front and rear ends, vents, and light wheels all creates a sleeker, less air-resistant vehicle reducing drag resulting in easier handling in fast speeds and better maneuverability. Cars that have been modified usually have increased engine power output. Car engine tuning can be in the form of engine exhaust wraps, nitrous injection installation, or chip tuning. Engine tuning is generally focused on adjusting engine timing, which can result in enhanced fuel ratio. The end result would faster and better performance for cars while on the road. To improve the physical appearance of the car and give it that efficient aerodynamic feature, exterior tuning body kits are installed. Other exterior tuning implements include lava lamps, ICEs or in car entertainment, woofers, audio amplifiers, DVD players and even television. Xenon lights and alloy wheels are popular car enhancements as well. To spice up a car‚Äôs look, some add stickers and attractive graphic designs.